In the tradition of The Sociopath Next Door, clinical psychologist Joseph Burgo’s The Narcissist You Know is a guide to help you identify, disarm, and coexist with extreme narcissists. In today’s social media and selfie-obsessed culture, we are living in an age of narcissism—and a society that often celebrates this potentially harmful trait rather than understanding it as a psychological disorder. Scientists are beginning to learn that narcissism exists on a spectrum—much like autism—and most of us exhibit some mild narcissistic tendencies. But one in twenty people fall into a category the author refers to as Extreme Narcissism, in which these self-absorbed characteristics result in destructive behavior that harms not only the individual but everyone around them, including friends, family, and coworkers. With more than thirty years of experience studying personality disorders and treating extreme narcissists, Dr. Joseph Burgo has developed a useful guidebook to help you identify, understand, and manage narcissistic personalities. 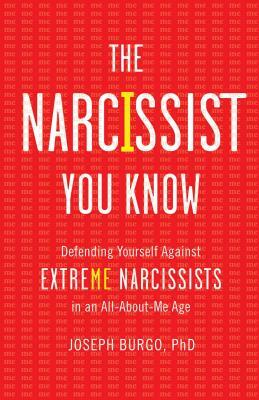 Relying on detailed profiles, vignettes from the author’s practice, and celebrity biographies, The Narcissist You Know offers easy-to-understand tools and solutions you can use to defuse hostile situations and survive assaults on your self-esteem should you ever find yourself in an extreme narcissist’s orbit. Don’t let narcissism destroy your relationships. Get the tools you need to understand, work with, and live with the narcissist you know. Joseph Burgo, PhD, has practiced psychotherapy for more than thirty years and held licenses as a marriage and family therapist and clinical psychologist. He earned his undergraduate degree in English Literature at UCLA and both his masters and doctorate in Psychology at California Graduate Institute in Los Angeles. Dr. Burgo has been quoted or featured as an expert on NPR and in publications such as USA TODAY, Glamour, The New York Times, and numerous other publications. As a writer on mental health topics, he is a regular contributor to The Atlantic and a frequent blogger for Psychology Today. "A guide for understanding our own narcissism and for figuring out the roles these people can play in our lives. Clear, easily digestible pop psychology." "A smart, fresh, andinvaluable guide to the types of narcissists and their behaviors, as wellas life- and soul-saving advice on how to deal with them or fend themoff." "Freshinsight into the troubling narcissism epidemic, providing us with signs to helpus recognize and disarm ‘the narcissist we know.’ A fascinating, timely bookby a leading expert who offers a real guide to dealing with self-absorbedindividuals in our 'all-about-me' culture. Highly recommended!" "Just when we had girded ourselves against the sociopath next door, Burgo alerts us to the narcissist across the street. What a neighborhood!" "Many of us hear the word 'narcissist' and automatically think about a self-absorbed person who constantly talks about himself—and yes, that's a very irritating (but small) part of it. ... It can be very difficult to know if he's simply charming because he's into you (normal),or he's charming because he's into you being into him (narcissist). ... Nobody wants that, so here's how to spot narcissists out there in the dating wild."